The 930I-OEM Particle Sensor uses advanced light-scattering particle counting technology and measures up to 6 channels of particles from 0.3 to 25.0 µm with a flow rate of 0.1 CFM (2.83 LPM). The light path is designed using high-end optical elements. 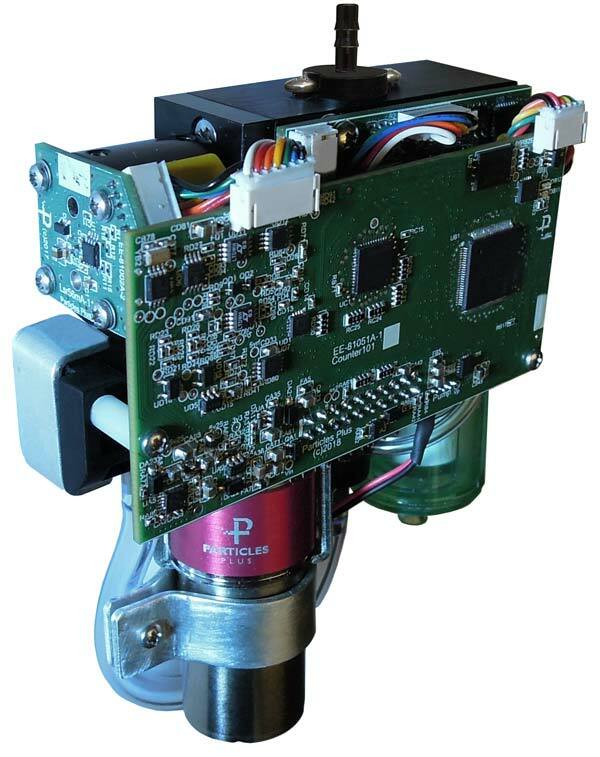 The sensor is designed in small form factor, and has an onboard differential pressure transducer with inline precision venturi that maintains feedback for constant flow control. It can be mounted easily in a vast number of instrument configurations. 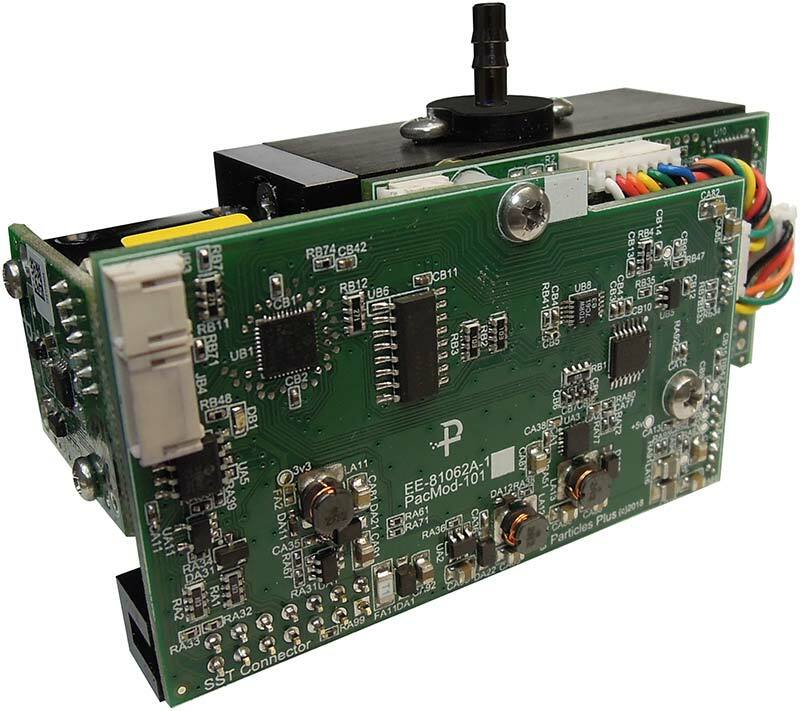 The 930 I -ACM-BASE Particle Counter measures up to 6 channels of particle count data from 0.3 to 25.0 µm with a flow rate of 0.1 CFM (2.83 LPM).The assembly is mounted on a plate for ease of integration. The unit includes a particle sensor, particle counter board, integrated vacuum pump and manifold with pre/post filters, real-time clock/calendar with battery backup, logging and data storage for up to 45,000 sample records, communicates via UART and operates from 7-15 vdc. All Particles Plus counters meet ISO 21501-4 and JIS B9921. The 930I -ACM Base ensure compliance with an on-board pulse height analyzer. 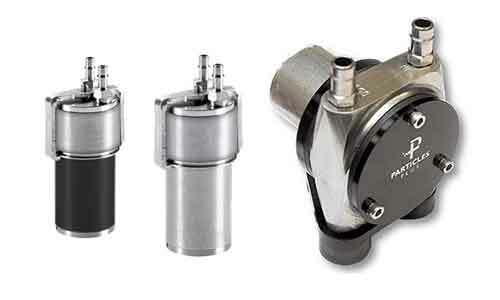 The Particles Plus Brush and Brushless Rotary Vane Vacuum Pumps produce either vacuum or pressure by compressing or expanding a volume of gas within a cylindrical steel housing. Within the housing is a compressed graphite rotor with two slots that contain compressed graphite vanes. The rotor is mounted to the shaft of the motor and is positioned off-axis to the center of the steel housing. As the motor shaft rotates, the vanes are pulled outward by centrifugal force. The vanes then make contact and slide against the inner surface of the steel housing, forming two internal and enclosed volumetric areas, which increase or decrease as the rotor turns, with a vacuum being created on the increasing side and pressure on the decreasing side. There are two ports positioned at the points of minimum volume with the increasing side being the vacuum port and decreasing side the pressure port.